It’s Miner’s Day. Shout out to all the Miners on their special day! Everyday products that we use are made up of raw materials that have been excavated from mines and are a result of the work of the miners. These men and women play a much more important role in our lives than most people realize. The Coal Mine Health and Safety Act of 1969 as well as the Federal Mine Safety and Health Act of 1977 were created to oversee the safety and health of all miners. Use #NationalMinersDay to post on social media. National Miner’s Day marks the anniversary of the worst mining accident in history on December 6, 1907, in Monogah, West Virginia. The disaster resulted in the deaths of 362 miners. 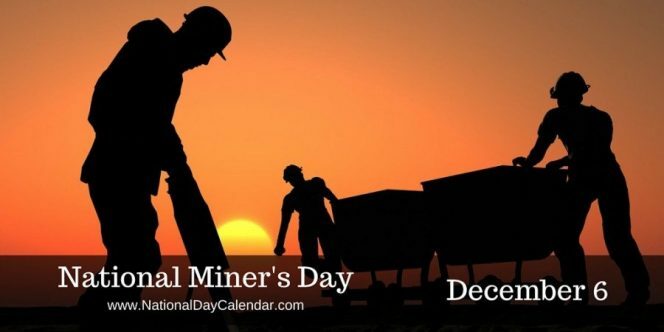 In 2009, Congress proclaimed each December 6 as National Miner’s Day.